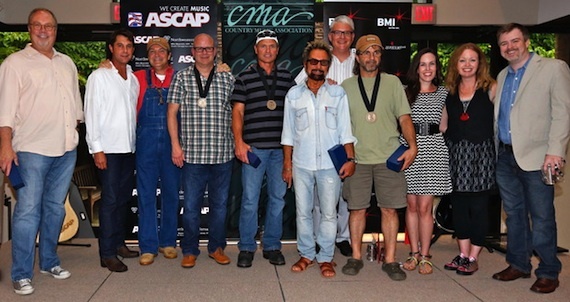 Pictured (L-R): UMG Nashville’s Mike Dungan, ASCAP’s Michael Martin, HoriPro Entertainment’s Butch Baker, co-writers Mark Bright and Tim James, Tony Brown, BMI’s Perry Howard, co-writer Phil O’Donnell, Delbert’s Boy Music’s Kirsten Wines, and Warner/Chappell’s Alicia Pruitt and Ben Vaughn. Photo by Ed Rode. ASCAP and BMI celebrated George Strait‘s 60th No. 1 single, “Give It All We Got Tonight” on Monday (June 24) at the Country Music Association offices. The ballad became Strait’s 115th career single and was the first release from his 40th studio album, Love Is Everything. The song was penned by ASCAP member Mark Bright and BMI’s Tim James and Phil O’Donnell. It marked the first No. 1 song as a songwriter for Bright, who is well-known for his success as Carrie Underwood‘s producer. Bright received ASCAP’s customary gift to songwriters who earn their first No. 1, an ASCAP guitar. Strait’s longtime producer and former MCA Nashville CEO Tony Brown was on hand for the celebration. This marks Brown’s 19th album with Strait. Current UMG Nashville CEO Mike Dungan was also on hand to honor the artist, label staff and the songwriters. “It’s an honor to work with George Strait, and to experience the 60th No. 1 is spectacular,” said Dungan. “I want to recognize the marketing team for the promotion 60for60. We have the best staff in the world,” he said before giving awards (affectionately known as “The Impaler Award”) to the songwriters and to Brown. MCA Nashville’s “60for60” promotional campaign, designed to give Strait 60 No. 1 songs while he was still 60 years old, pushed “Give It All We Got Tonight” to No. 1 on the Mediabase chart the week of May 12- 18, 2013 — just days before Strait’s 61st birthday. Publishers Delbert’s Boy Music, Butch Baker of HoriPro Entertainment and Ben Vaughn from Warner/Chappell were also on hand to congratulate the group.